Today I was working on one of my 8×8 baby scrapbooks and I was looking for a certain color of paper to emboss a sentiment on. The only paper that I could find that would go with the background paper happened to be a shiny, metallic paper. I had never tried to emboss on that before because I just assumed that it wouldn’t work. I had tried to stamp on shiny paper and unless you use an ink like Stazon, it takes a long time to dry and smudges. 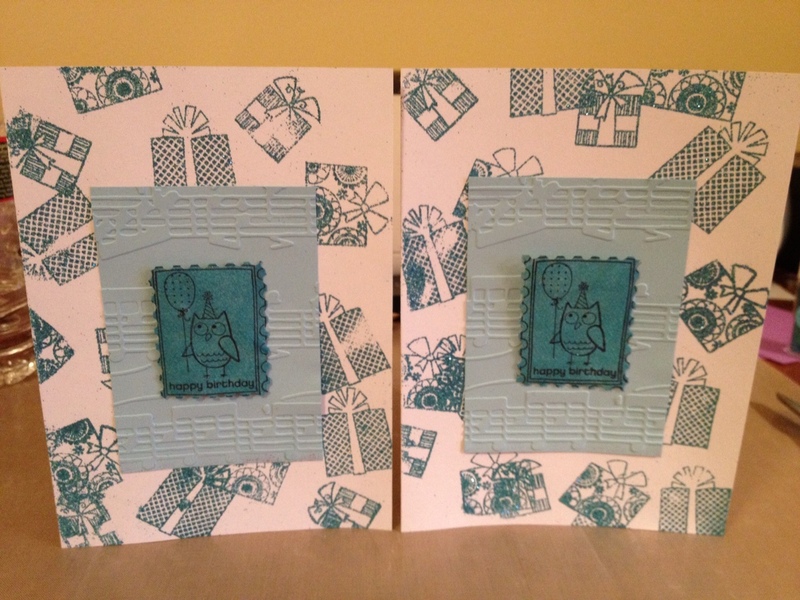 Because of my stamping experience with shiny paper, I stayed away from embossing on it. I had to try three different times before I got something I liked. 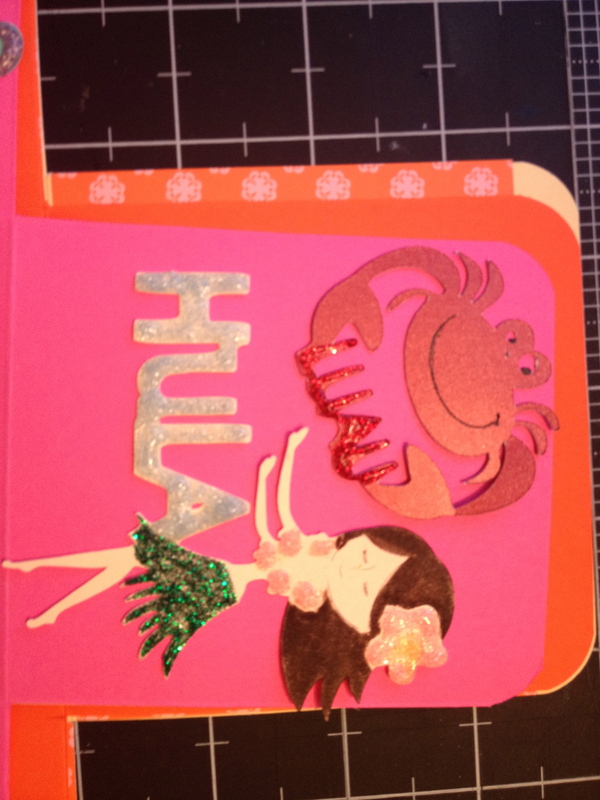 The first time, I used green glitter Martha Stewart embossing powder. The result wasn’t exactly what I had hoped for. Between the shininess of the paper and the glitter in the powder, it was too much. 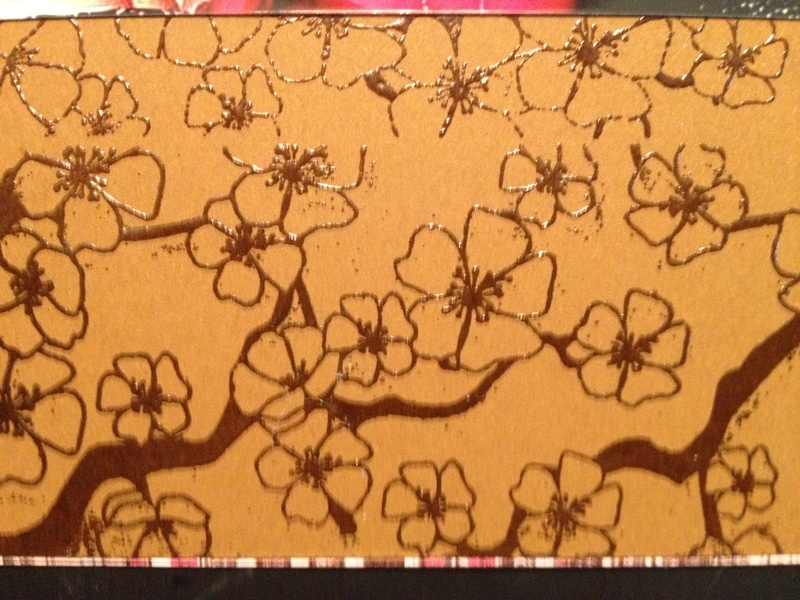 So, the second try was a white embossing powder by Martha Stewart. When I hit it with the heat gun, I realized that it was an opaque powder and not the regular white. I accidentally grabbed the wrong one! Ahhhh! Oh well. It came out good, but not great. The opaqueness made it too difficult to see the words once it was placed behind the page protector. On to the third try. 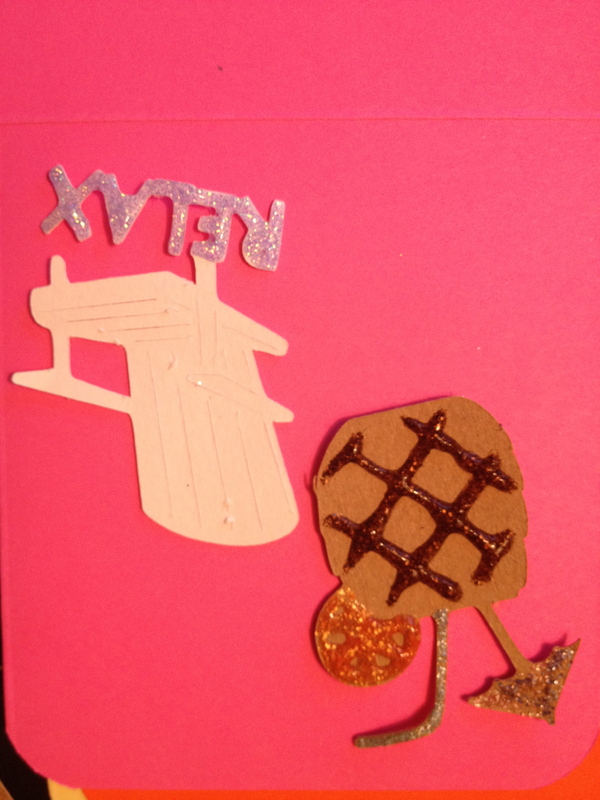 Posted in Embossing Powders, ideas, VersaMark and tagged embossing powder, heat gun., Martha Stewart, shiny paper. Bookmark the permalink. A couple of months ago, I stumbled upon a video on how to make an explosion box. Since it was a step by step video, I used that to help me make my first one. I didn’t go crazy decorating it, but I still think it turned out cute. When we were trying to come up with an idea for my sister and her fiancé’s wedding gift, we decided to get them a gift certificate to the hotel that they were staying at. This way, they could use it for dinner, drinks, the room, sightseeing or whatever else they wanted. 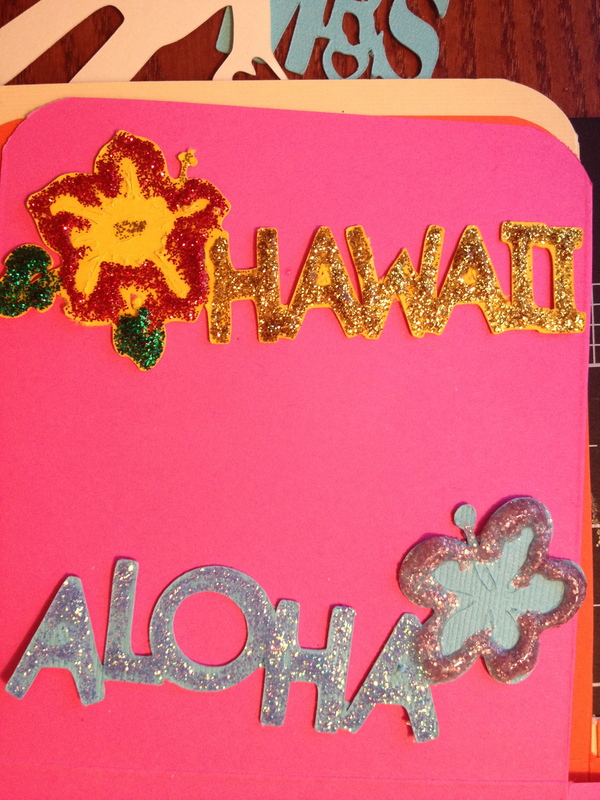 If you know me (or have read some of my other posts), I couldn’t just give them a gift card or a card saying that the gift card is waiting for them in Hawaii. So, I decided to make them an explosion box! 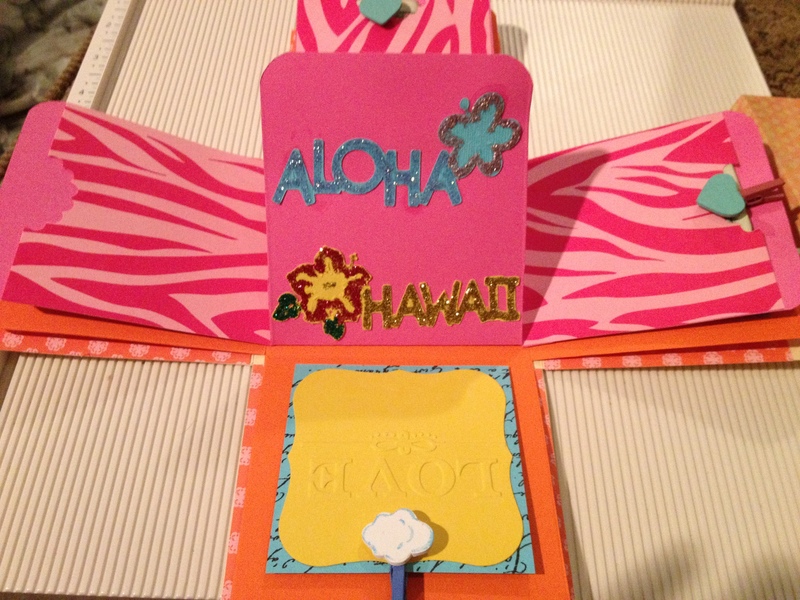 I thought that I could decorate part of it with wedding related icons and the other part with Hawaii related items. I started off with the outer most layer. I knew I wanted this to be the wedding part, since it was for their wedding! 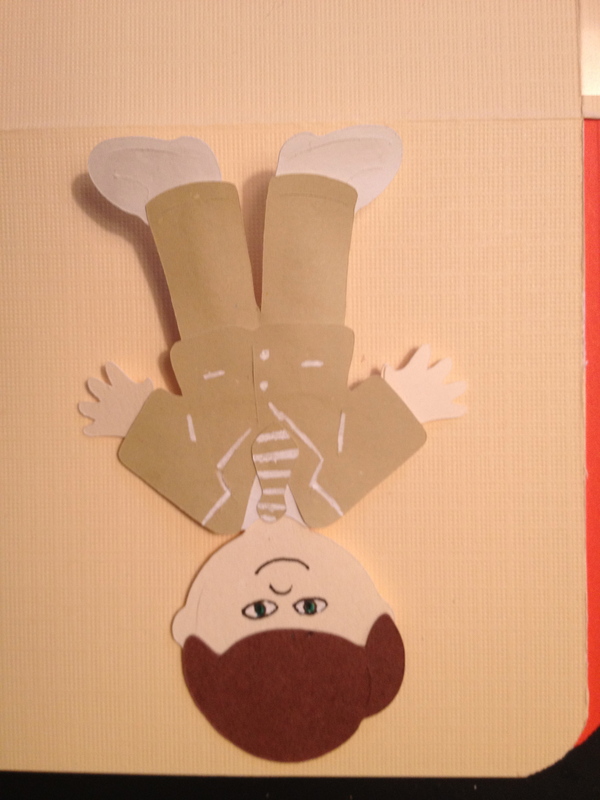 I created the bride from the Everyday Paper Doll cartridge. When I tried to cut the flowers out for the bride, the paper kept ripping since it had to be cut so small. 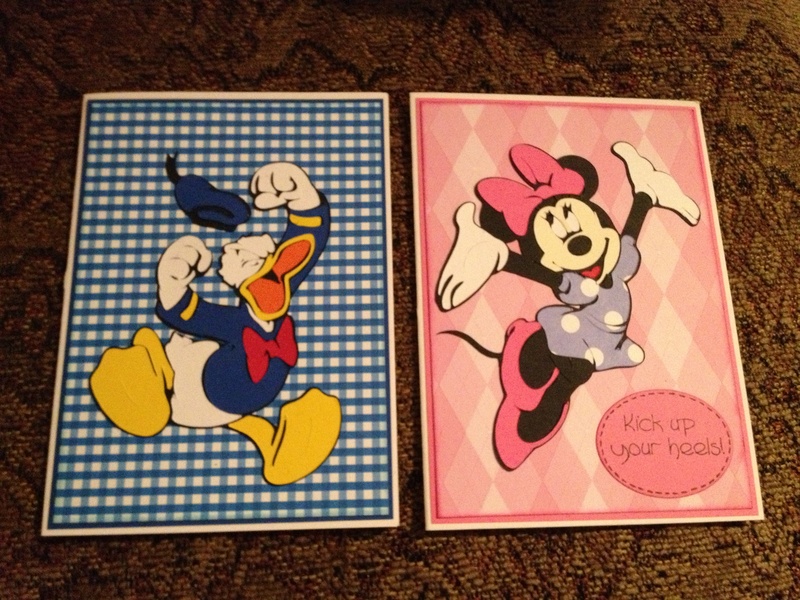 Instead, I cut them out in blackout and then ran them through my Cuttlebug Swiss Dots folder. This gave the effect of the center of the flower and then I was able to just draw the outline of the flowers around them. I used Frosted Lace Stickles around her veil to give it some shine. I used the same cartridge for the groom, but since this was a beach wedding he wasn’t going to wear a tux. I chose the prom boy suit and then made it tan. I added some white gel pen stripes to the tie to help it stand out from the suit. The next side I did was the Mr and Mrs and rings side. I cut these pieces from my Sweethearts cartridge. 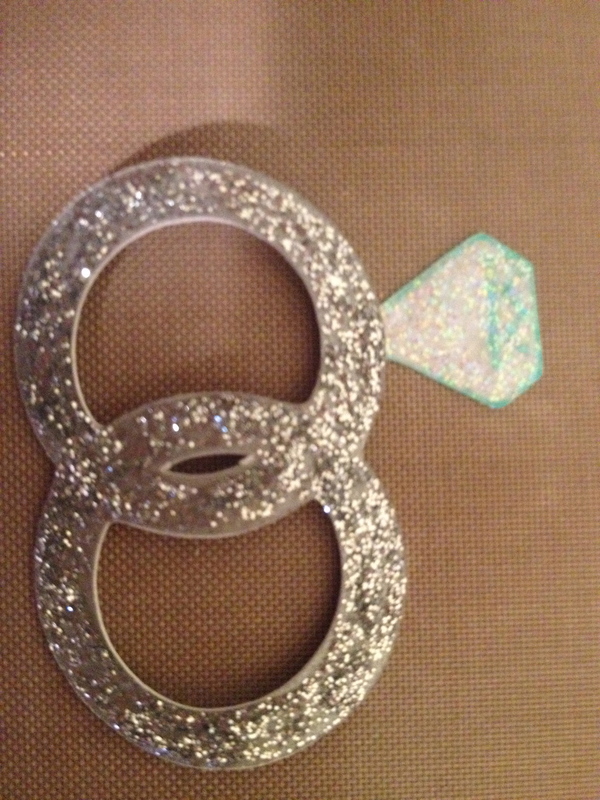 When the rings were cut out, you couldn’t really see the lines in the diamond, so I went over them with my teal pen. 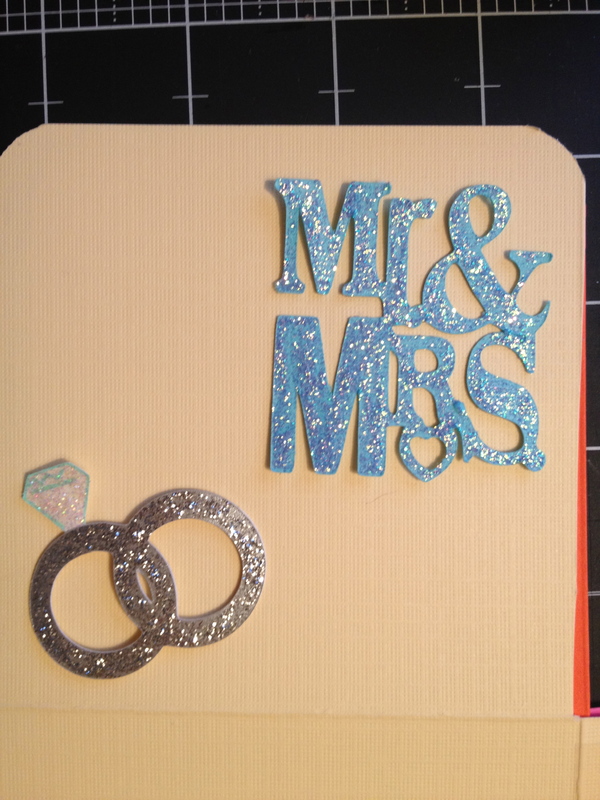 Then I decided to use my silver stickles to go over the bands and then my Diamond stickles to go over the diamond. 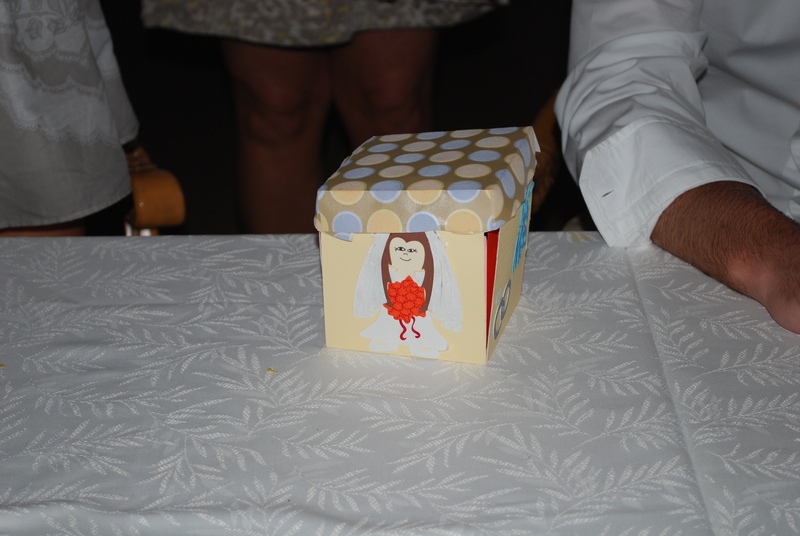 I used one of my blue stickles to go over the words Mr and Mrs.
For the last side of the outside of the box, I chose a sticker that I already had of a wedding cake. 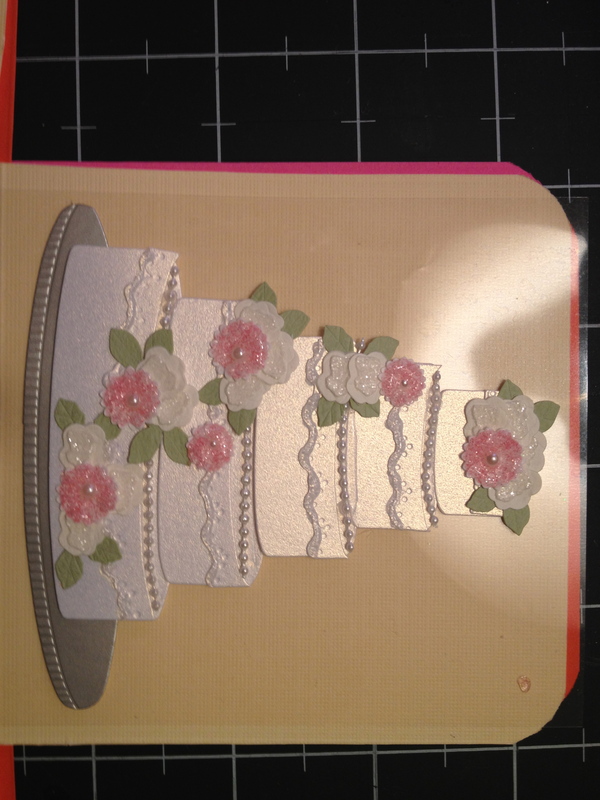 It looked a little plain to me so I added Cotton Candy stickles over the flowers to give it some color and some white stickles to the frosting on the layers to give it some more dimension. After that was done, I had the four outside panels of my box done. The next step was to create pockets on the backs of the outermost layer. I did this by taking patterned paper and cutting them down to the same size as the layer and then taking my scallop punch and punching out a little lip in each pocket top. 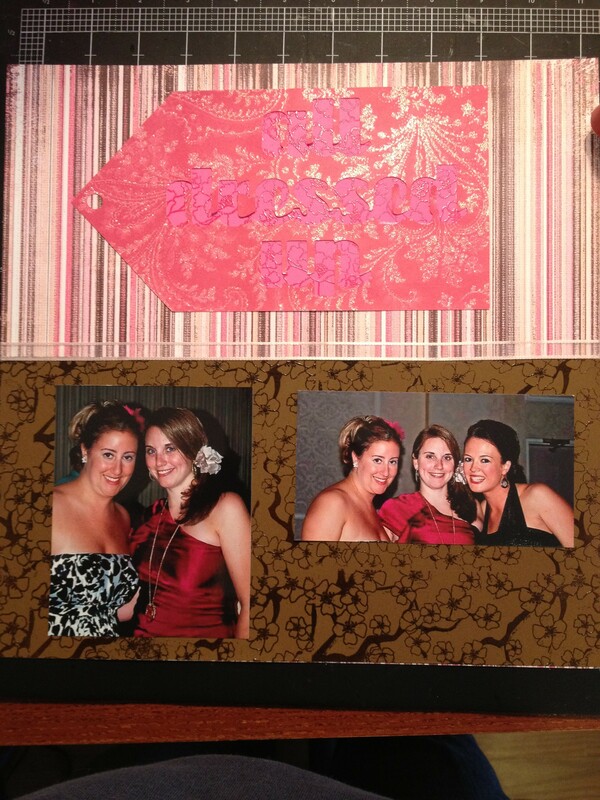 I decided to use wedding words and icon stamps I had in my collection to go on the inserts. I stamped the images in VersaMark and then heat embossed them with white powder. For the last layer’s pockets, I found a quote that I was able to divide up into four parts. I used the clothes pins to number each paper and then added an envelope to the bottom of the inside layer. In that envelope was a message to the bride and groom explaining that their present from all 8 of their siblings was waiting for them in Hawaii. As always, feel free to leave questions or comments. Thanks for stopping by! Posted in Cricut, Cuttlebug, Embossing Folders, Embossing Powders, ideas, stamps, VersaMark, YouTube and tagged clothes pins, Cricut, Cuttlebug, embossing, embossing folder, embossing powder, Explosion box, gift card, gift certificate, honeymoon gift, Michaels, Stickles, wedding, wedding gift, wedding gift idea, white gel pen, YouTube. Bookmark the permalink. April is going to be a crazy month! Between birthdays and communions, starting work full-time again (mixed feelings on that one! ),two trips (one work related, one for fun) AND Easter, I think that there’s something I have to do every single day. 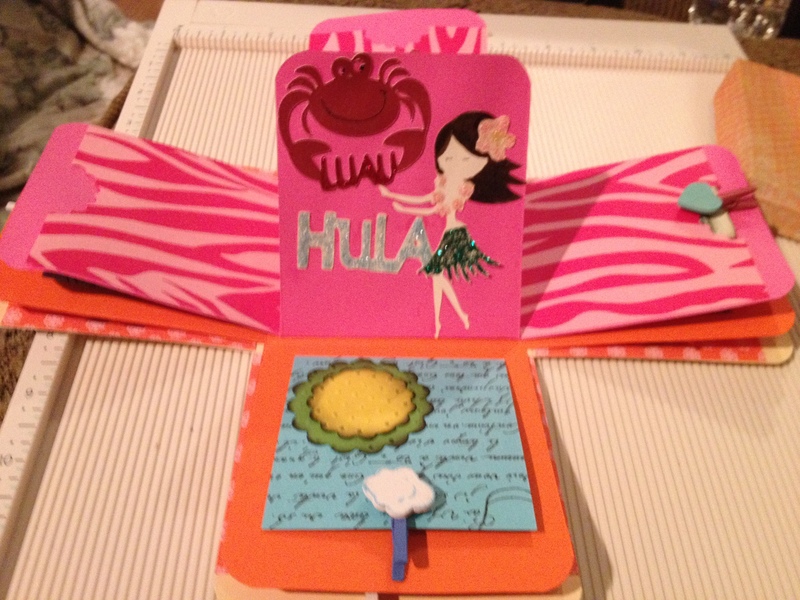 I wrote a list of the projects I needed to work on and the first ones I tackled were the birthday cards. I started off with my godson’s card. Since he is a twin, I thought it would be easiest to make two of the same card. That way I could cross two people’s names off my list! I don’t like doing that because the boys are different and have different separate interests. But, for the sake of time, I did it this way. I went though all of the stamps that were birthday related (much easier now since I reorganized my stamps!) and came across a set with three different presents. I decided I wanted to emboss the background with the presents and I chose a Martha Stewart glittery blue embossing powder. 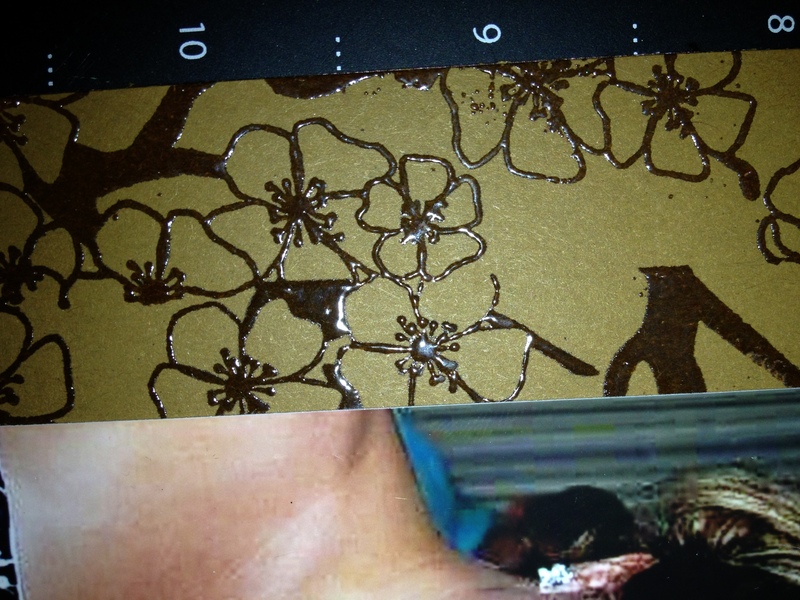 If you use the glitter embossing powders, it is harder to tell when the powder is melted. Unfortunately, I had that trouble with the background of these cards because of that. After I embossed the card, I chose another stamp that has an owl with Happy Birthday on it. I used broken china distress ink on a scrap piece of paper to change the color of the paper and then stamped the owl image twice onto it. Then I took the postage stamp border from EK Success and punched around the edges of the stamped image. I also used a lighter piece of blue paper that I ran through the Cuttlebug with the Allegro folder (I think that’s what it is called – it’s the one with all the music notes) and then put a pop dot on the back of the owl image and attached those pieces to the card. For the inside I used red Chalkbox ink to ink up a Happy Birthday stamp. I used another shade of blue paper to cover the inside (I made a mistake on one of the cards so I needed something to cover it up) and stamped the Happy Birthday in red. Under that I wrote each boy’s name on their own card and then signed it. The last step was to put a design on the envelope. I chose a longer stamp that has cupcakes across it. I used Black Momento ink to ink up the stamp and then stamped the image on the outside flap of the envelope. 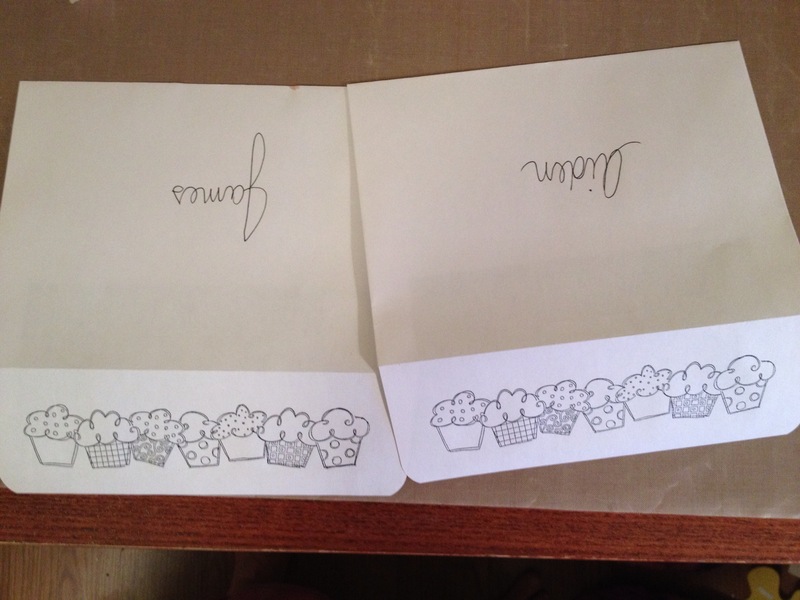 I then wrote the boys’ names on their envelope and that’s it! 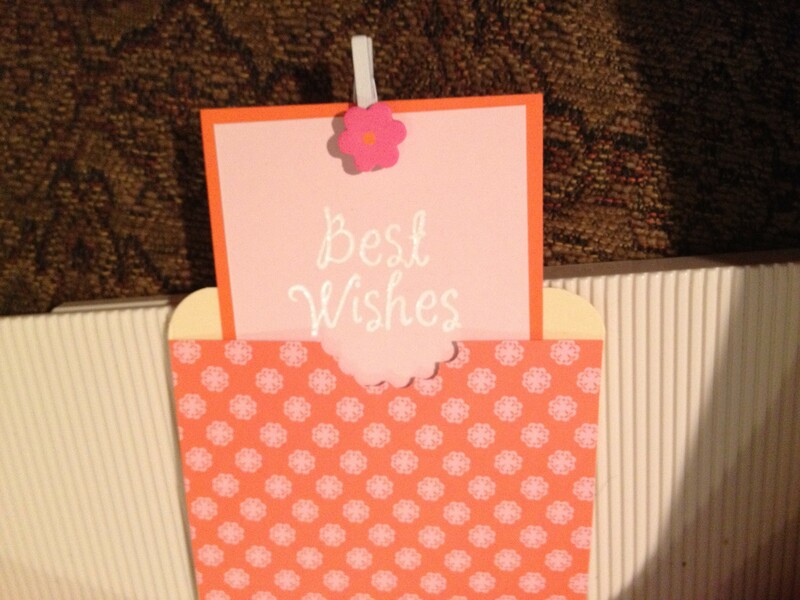 The card’s design is relatively simple and it didn’t take me a long time to make them both. The most time consuming part was the embossing. There are some mistakes on the cards, but I am sure that two 8 year old boys aren’t going to notice! Posted in card making, distress ink, Embossing Folders, Embossing Powders, ideas, stamps, Stamps for crafting, VersaMark and tagged birthday cards, broken china distress ink, cards for boys, chalk box ink, cupcake stamp, owl stamp, presents stamps, versa mark. Bookmark the permalink. I haven’t had time to post a lot of projects lately because it’s been crazy over here! I’ve been calling it wedding sweatshop lol. Some of the things I can’t post until after the wedding (I don’t want to give away any of the surprises for my sister’s guests who might read my blog!) and other things won’t be posted until much later. In between all of the wedding related items, I did have some time to work on an Easter card and to (re)organize my stamp collection. I’ll start with the stamp collection. At first I was using two of the large photo/paper boxes that you can find at Michael’s or AC Moore – one to hold the wood mounted stamps and the other for clear stamps. The problem with this is that when I needed a certain stamp, I had to dig through this huge box of stamps and usually it was one that was at the bottom of the pile that I needed. (Of course – why would it be easy?) I got fed up with doing that so I decided it was time to rearrange! I took all my stamps and divided them into categories. I have holidays, wedding, travel, animals, words/phrases/letters, girls night out (shoes, purses, and a stamp set called girls night out! ), patterned, etc. This will make it easier when I am working on a holiday card or layout – I can just grab the box with all the event related stamps and am ready to go. I then placed them into the smaller photo/shoe boxes and placed them around my desk. Before I stacked the boxes two high, but inevitably I would need something from the bottom box every time! So I rearranged the desk so that the shoe boxes line it instead of being on top of each other! For right now I have just done this with my stamps. Eventually I would like to place my stickers and embellishments of the same themes together with the stamps, but I just didn’t have the patience yesterday. (All the stickers are in two binders and already divided by categories). After the clutter was removed from my desk, I was able to work again! 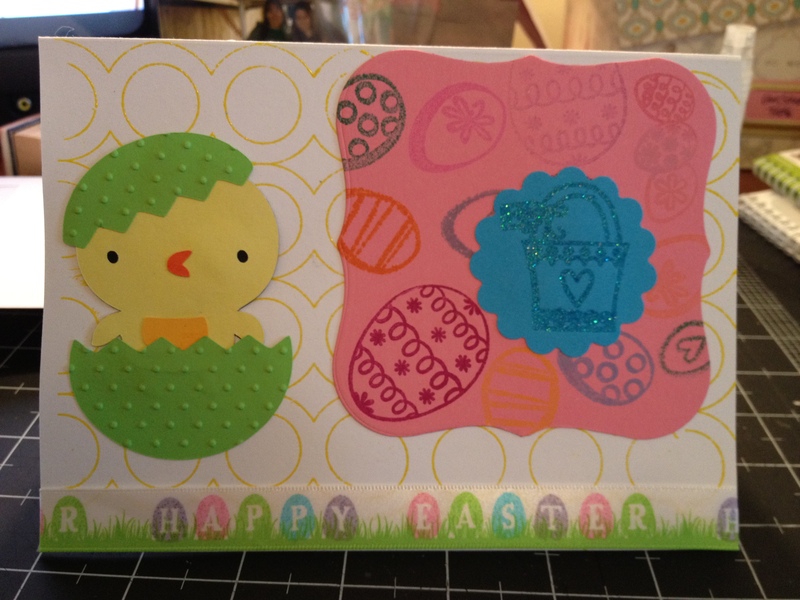 I started on an Easter card and immediately came the scrapper’s block. I had a bunch of stamps that I wanted to use, but I wasn’t sure where to start. I looked at my background stamps and chose a circle pattern. I wanted to emboss it, so I stamped that with VersaMark and used Martha Stewart yellow embossing powder to create the background. I then used my Spellbinders Nestabilites die (label one), took the largest die and cut out a pink shape for part of the background. 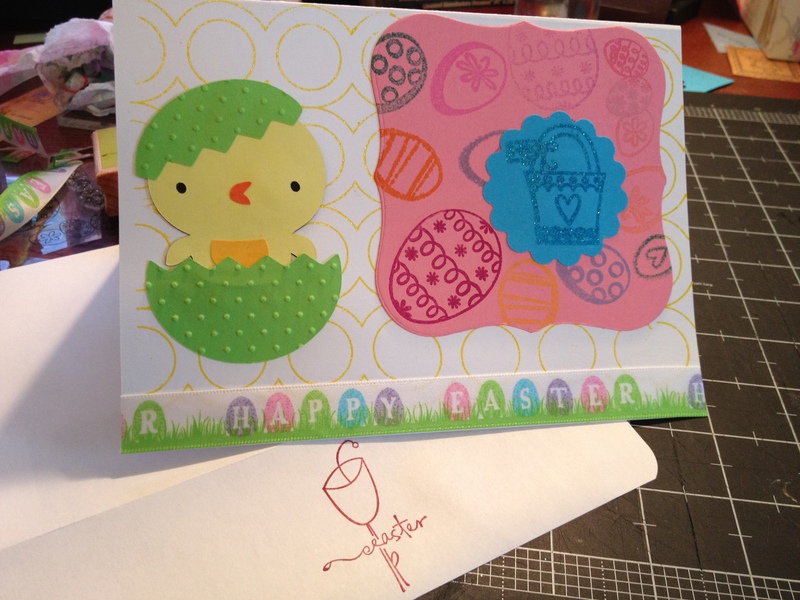 I then took the stamps and used bright and pastel colored inks to stamp the different sized eggs all over the pink paper. Originally when I stamped the eggs, I used a light purple for one of the large eggs. It hardly showed up on the paper, so I reinked the stamp with a maroon color and was able to go right over where the first stamp had been. This is one of the major advantages to using clear stamps. Since you can see through the block and the stamp, you can usually go over your stamped image with ease if part of it didn’t get stamped or if you need to use a different color ink. Ok – back to my project. 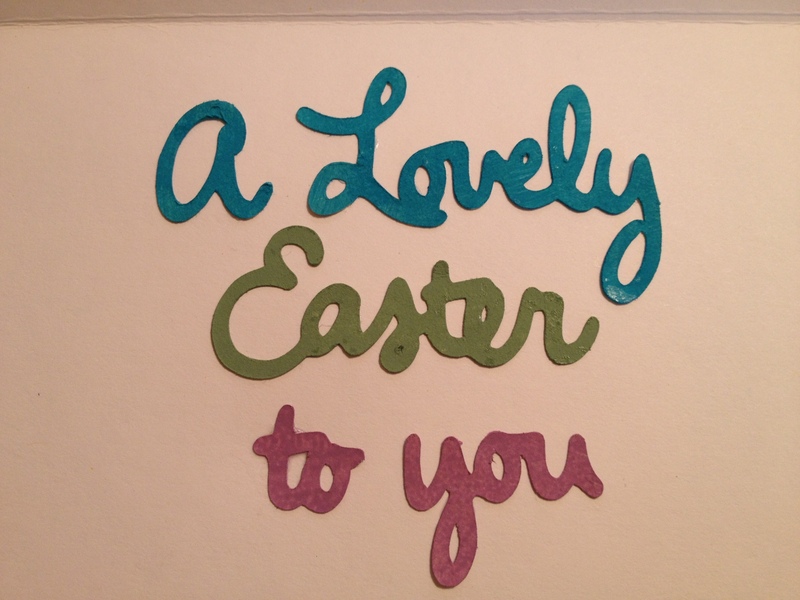 I picked up some Happy Easter ribbon the other day and knew I wanted to use it at the bottom of the card. 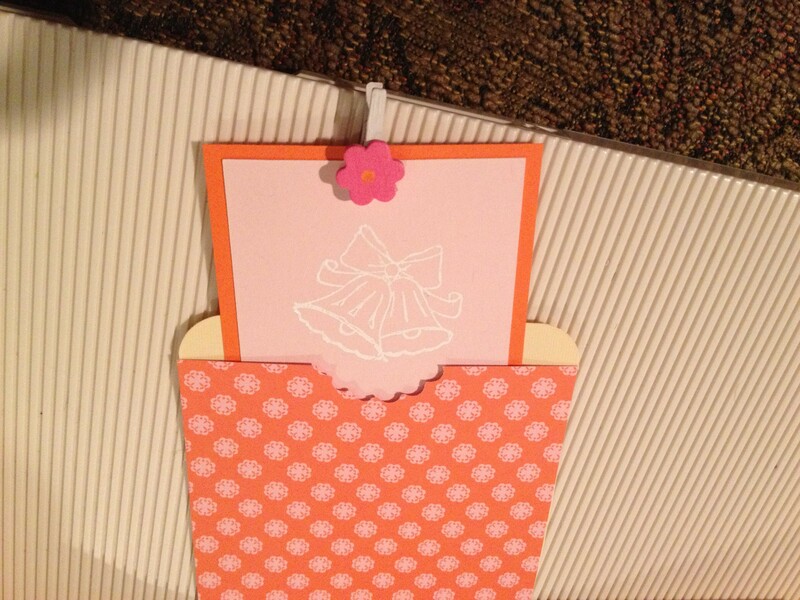 Once that was adhered, I placed the pink shape on the card and decided it needed some more elements. I then took a scrap piece of blue paper and inked up a basket stamp with VersaMark. For the embossing powder, I chose one of Martha Stewart’s glitter embossing powder and it shows up almost clear with a sparkle! I really liked the effect. Next I took the x-large cameo punch from Fiskars and punched out the basket to be placed on top of the pink cutout. When it came time for the sentiment, I realized that all of the Easter stamps I had were too small. I picked up a bunch from the $1 bin at AC Moore and the sets are tiny. 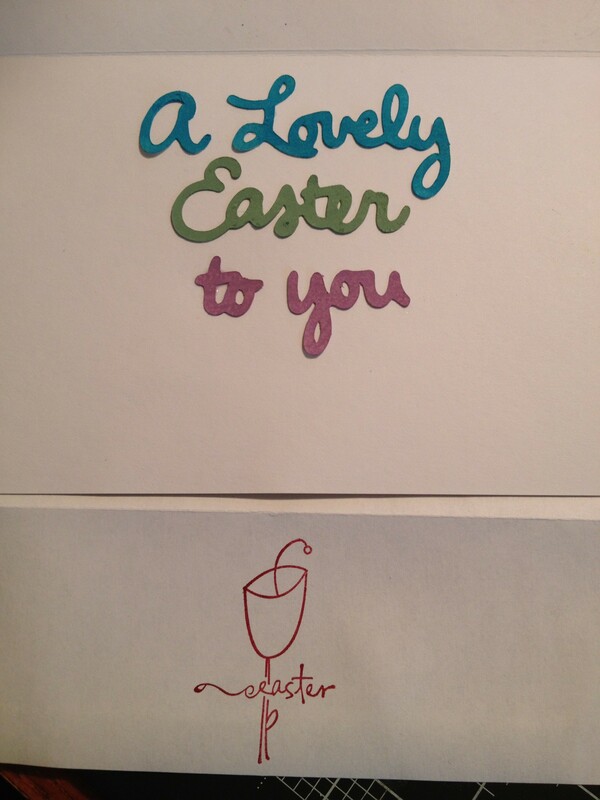 So, I again went through my Cricut books and found the phrase A Lovely Easter to you (from the Wild Cards cartridge). 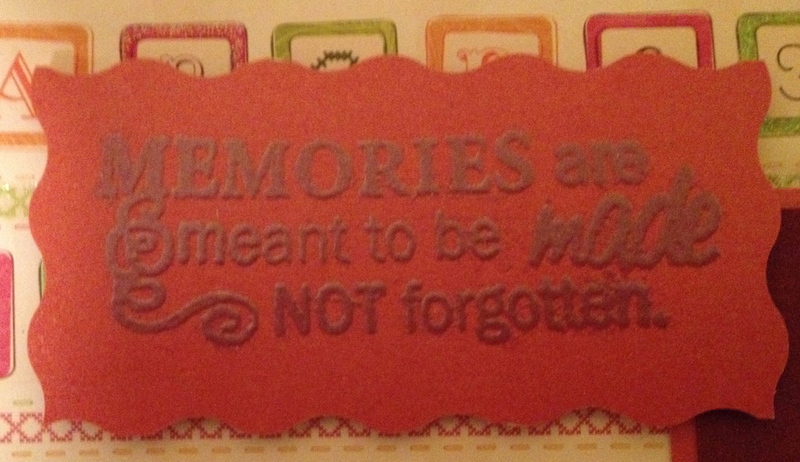 The phrase was cut out from a scrap pack of paper I got on sale at AC Moore. I picked up paints when I was there a couple of weeks ago because I wanted to start adding paint to some of my projects. I bought a teal, purple and a green color and thought – maybe I should paint the words? 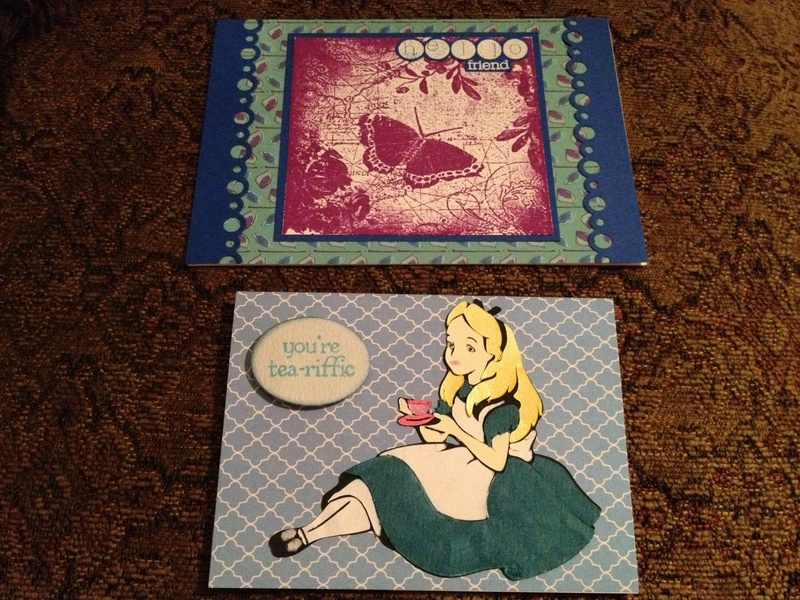 I did and once they were dry, I adhered them to the inside of the card. The last step was to take a wooden Easter stamp I had, ink it with maroon chalk ink and stamp the image on the outside flap of the envelope. Hope you enjoyed this card! Please feel free to leave any comments – thanks for stopping by! Posted in card making, Cricut, Cuttlebug, Embossing Folders, Embossing Powders, ideas, stamps, Stamps for crafting, Storage, VersaMark and tagged ac moore, cameo punch, chick, cling stamps, Easter card, Easter eggs, Fiskars, Martha Stewart, Michaels, organizing stamps, paint, photo boxes, stamp tips, wood mounted stamps. Bookmark the permalink. For my tenth challenge, I decided to do another technique with VersaMark. When I originally bought the VersaMark ink, I thought that you only used it for embossing. I am glad that I am finding that there are many other ways that you can use it! This layout shows one of those different techniques. To start out, I used an image that I had cut before but wasn’t the right size. It was a large tag that says all dressed up and I had cut it out of glitter paper. 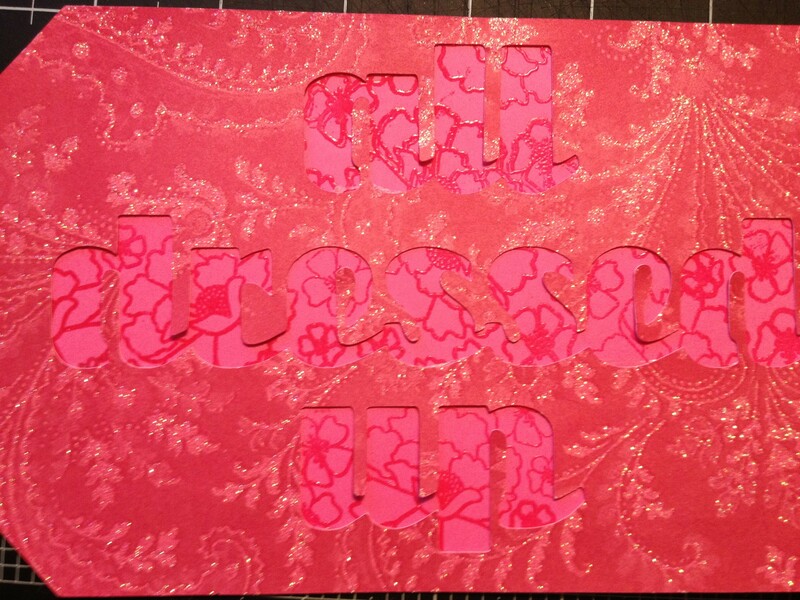 The words “All Dressed Up” are cut out and when I placed it on the background, I thought it didn’t look as nice as it could. 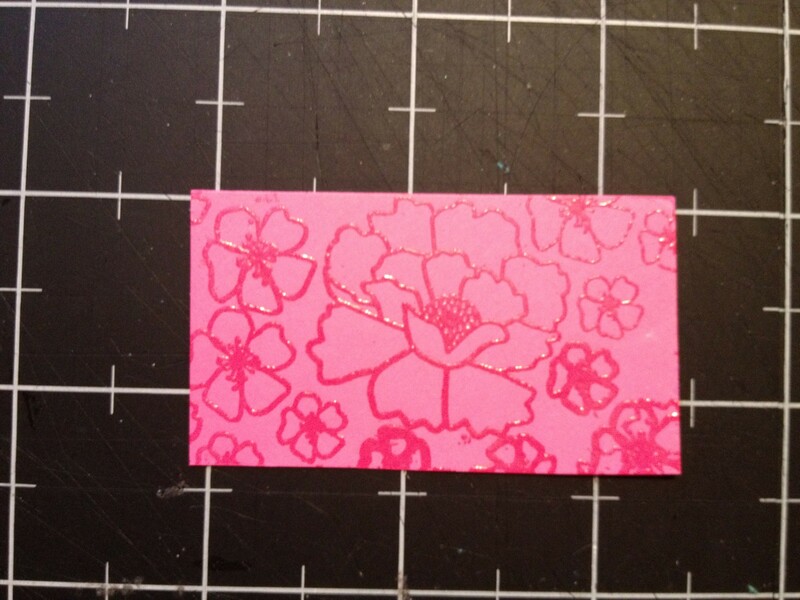 So, I took some pink scrap paper that I cut into strips. When I placed those behind the cut out words, it still didn’t look right. I found a stamp set that I haven’t really used much (Fiskars Asian Inspired cling stamps) and chose one of the flowered stamps from there. 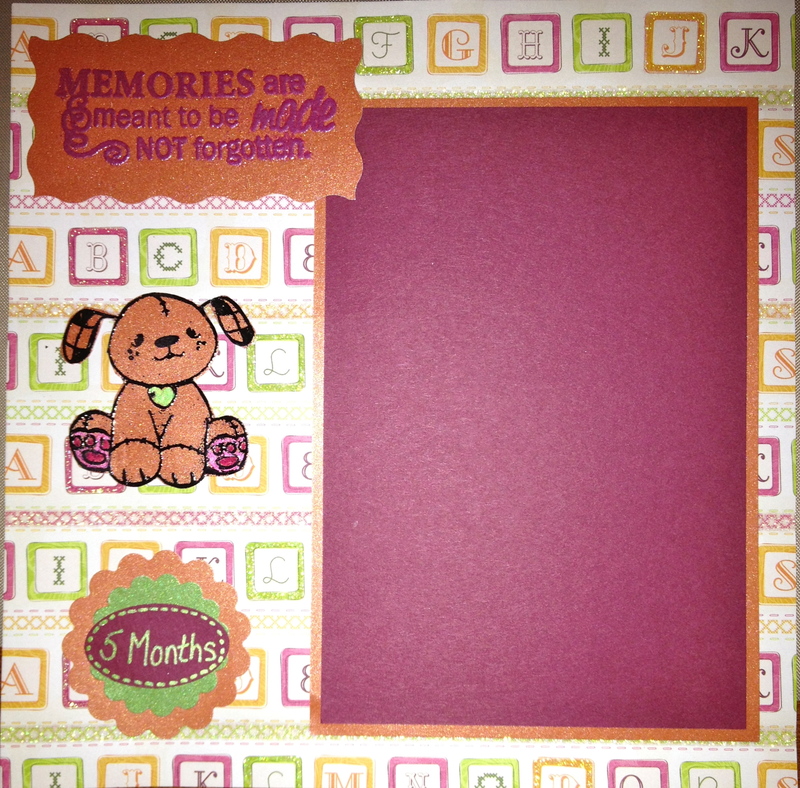 I wanted to emboss that image, but I didn’t have the correct color pink embossing powder. However, I did have worn lipstick distress ink, which would be perfect! Hope you like this page! As always, feel free to leave comments or suggestions! Posted in Challenge, creating your own embossing powder, Cricut, distress ink, Embossing Powders, ideas, scrapbook tips, stamps, VersaMark and tagged asian inspired stamps, distress ink, embossing powder, flowers, tags, worn lipstick. Bookmark the permalink. Tonight I decided to try to make another card from this cartridge. One of my friends is having a birthday this month so I thought I would make a card for her. Looking through the images available on this cartridge, I found one with a birthday cupcake and made it for her. I started off making the envelope (see previous Wild Card Cartridge post for the reason) and it was able to be cut at 5 1/4 inches. First I cut the image out regularly (icon plus shift key) in purple and then I cut the image in blackout (icon, blackout and shift keys) in white. 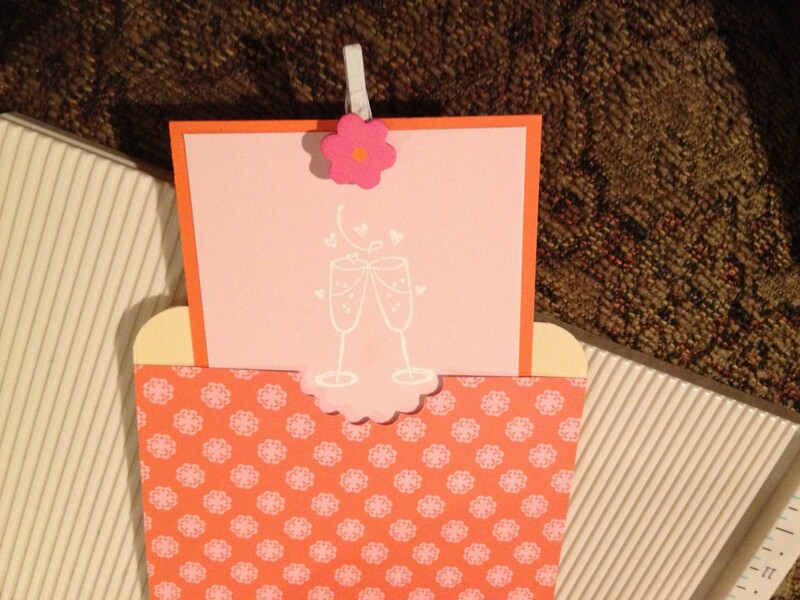 Doing so makes a nice liner for the card and it also helped camouflage a minor error. When I cut the first image, one of the candles did not cut out correctly. 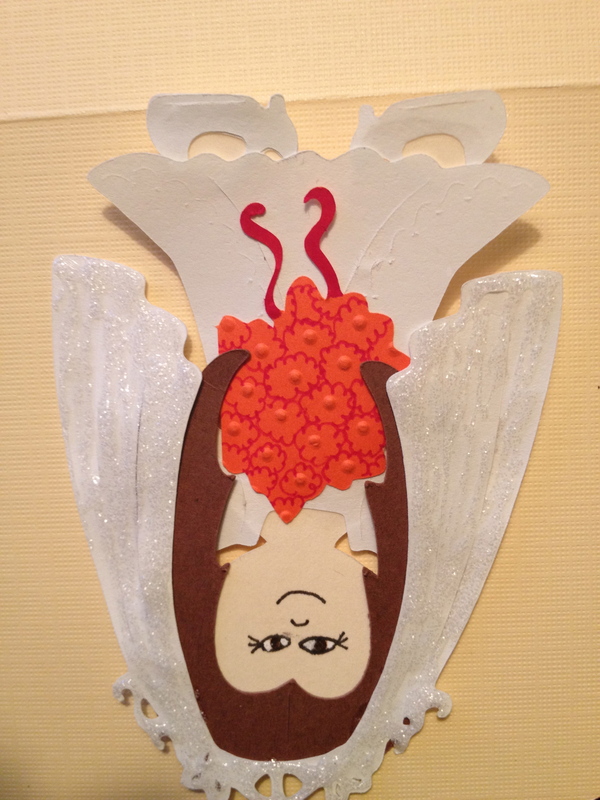 Next I cut out the card at the same size, 5 1/4 inches, in white card stock. 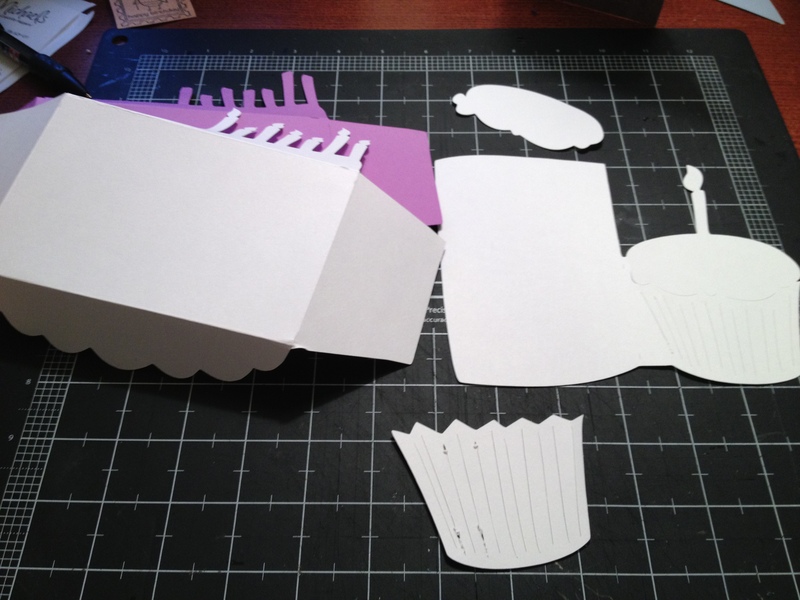 I then also cut out the layers of the cupcake in white card stock. For the wrapper, I applied VersaMark to the whole surface and then applied silver embossing powder. 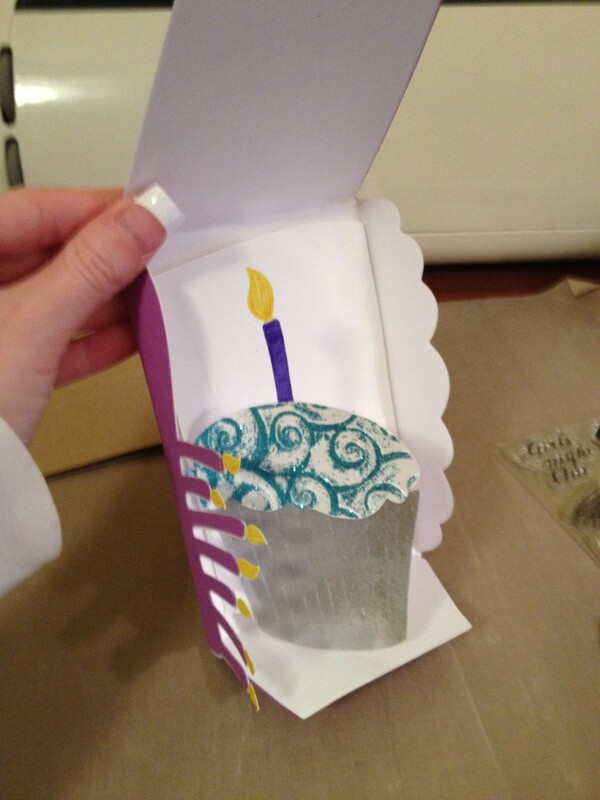 Once it is heated, the wrapper looks like the shiny tin foil wrappers for cupcakes! I then took the icing of the cupcake and ran it through the Cuttlebug to create some movement in the icing. Next, I applied VersaMark to the raised part of the image and applied shiny blue embossing powder to the icing and heated it up. 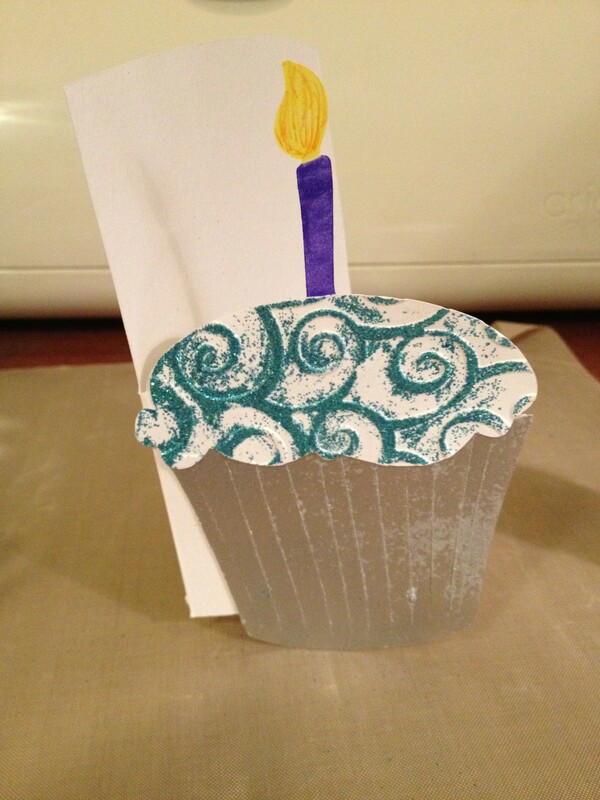 Then I glued those two pieces on top of the cupcake on the card and colored the candle and flame in with marker. 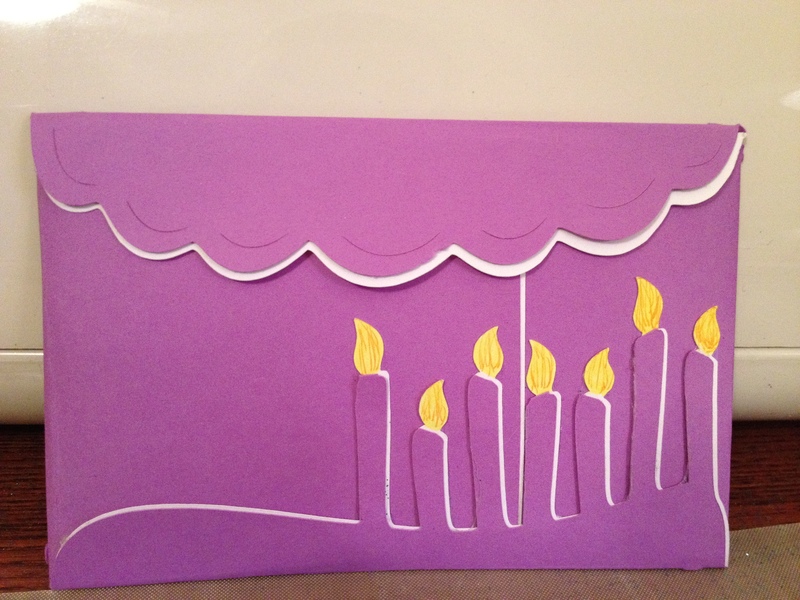 To fix the error that was made cutting out the purple layer of the envelope, I cut off the flames on the purple candle. 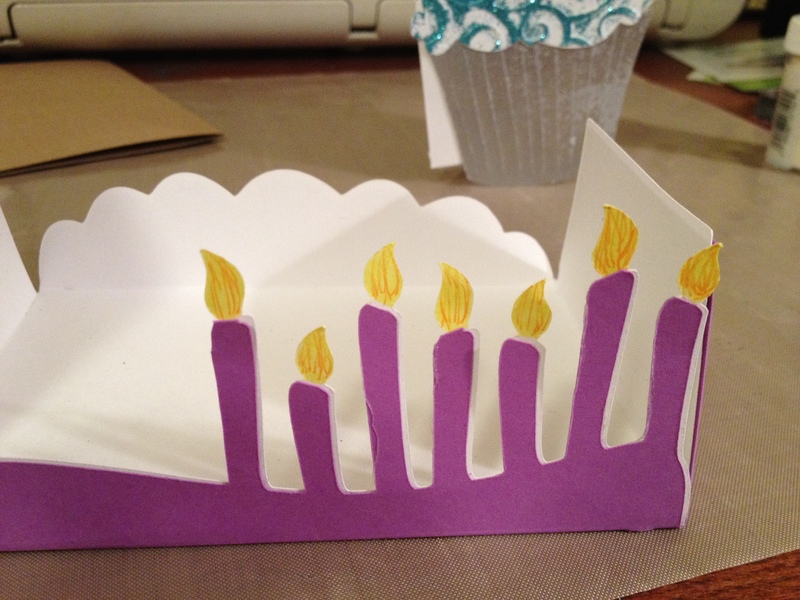 I used the same technique I did on the candle on the cupcake for the candles on the envelope. I then glued the white liner to the purple envelope and then adhered the sides to form the envelope. 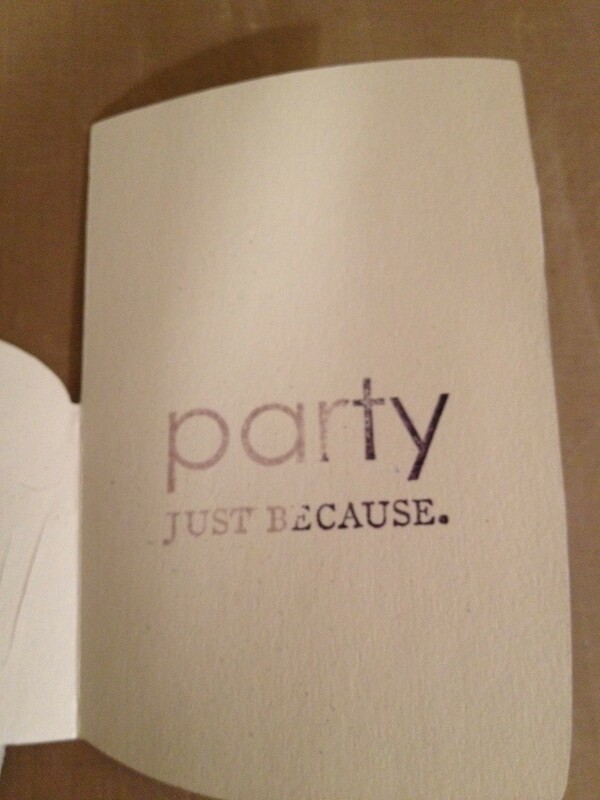 The final touches on the card were to stamp – party just because on the inside of the card. I took two different shades of purple (milled lavender and dusty concord) and inked up the stamp. 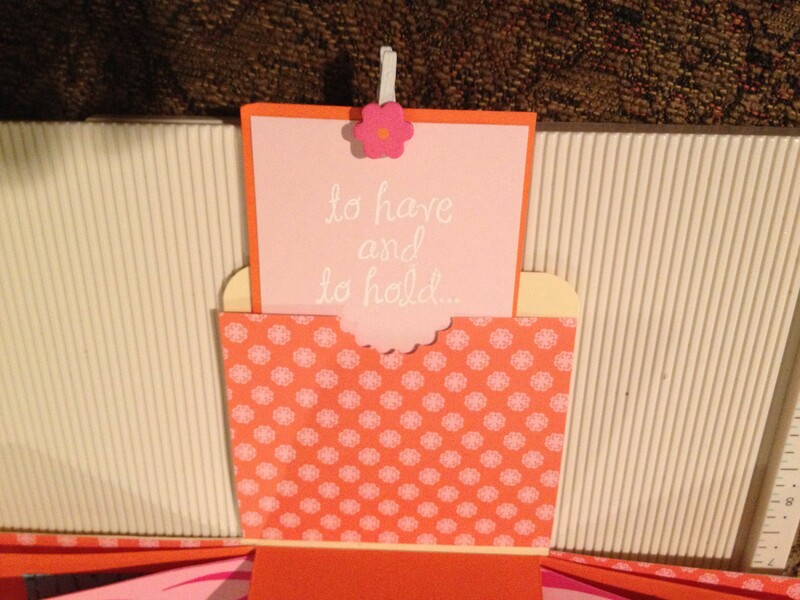 Once that was complete, I glued the top of the envelope together and the card is ready to send! Posted in card making, Cricut, distress ink, Embossing Folders, Embossing Powders, ideas, scrapbook tips, Uncategorized, VersaMark and tagged birthday card, cupcakes, Cuttlebug, embossing folder, embossing powder, party, wild card cartridge. Bookmark the permalink.